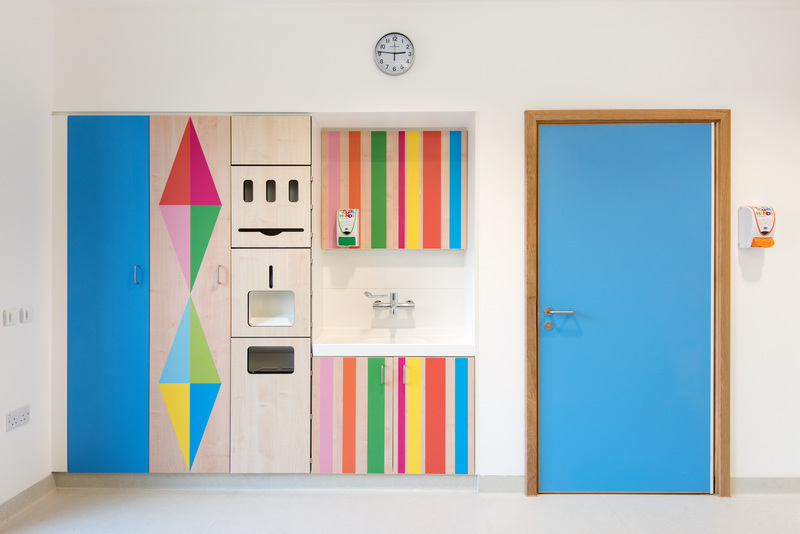 The designer was commissioned by Artfelt to create colourful, “uplifting” designs for the hospital, with the aim of improving the environment for patients and staff. 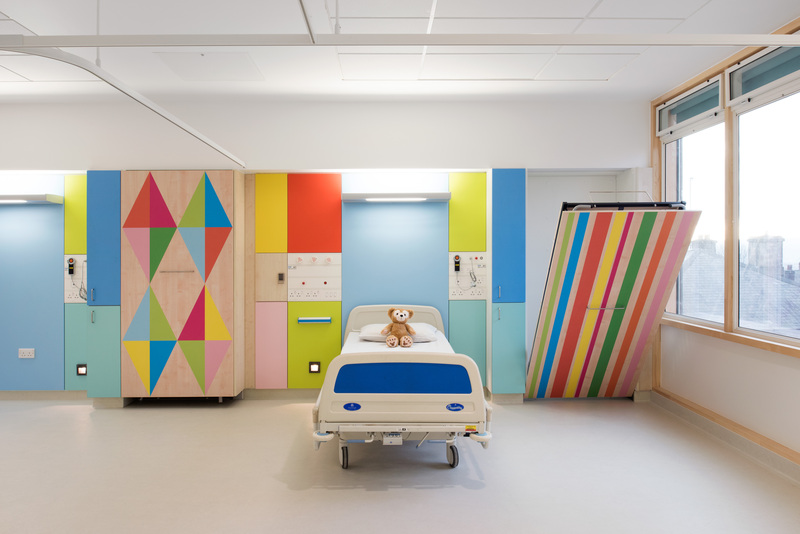 Morag Myerscough has redesigned rooms and wards within the Sheffield Children’s Hospital, transforming them into “uplifting” spaces. Myerscough was commissioned to complete the project by Artfelt, an arts programme funded by The Children’s Hospital Charity. 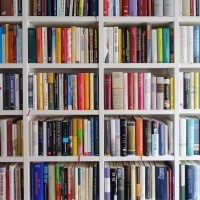 The project was funded by the charity’s budget for the hospital of £10 million, which goes towards its development, medical research and specialist equipment. 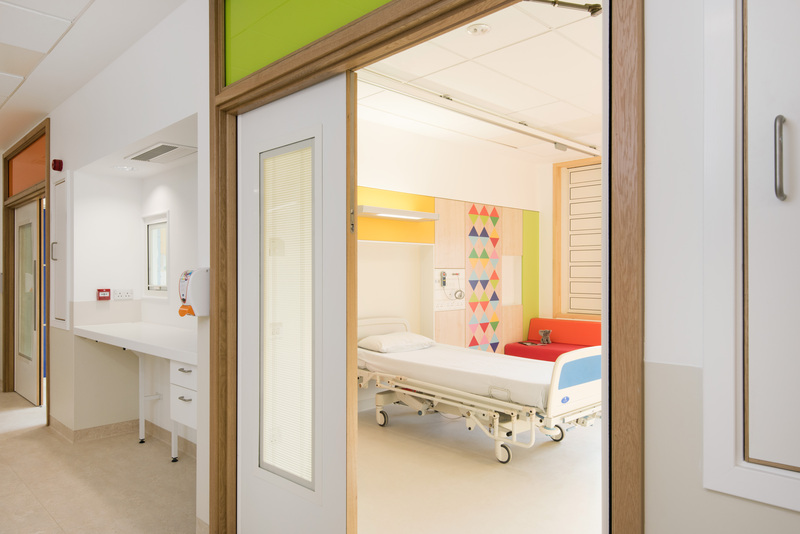 The project sees four different wall designs implemented across 46 ensuite bedrooms in the hospital’s new wing, which was built by Avanti Architects and opened at the end of last year. Myerscough has also created a ward design, which is used across six wards. The four designs are of “different degrees of brightness and intensities”, says Myerscough, aimed at different age ranges of children and for different medical conditions. This varies from a multi-coloured concept to a pale blue concept designed for children who have conditions like autism who may be sensitive to bright colours. Myerscough’s design concepts were subject to patient and clinician feedback, with Artfelt presenting both groups with miniature, scale models of redesigned rooms and gathering their opinions. Roughly 25 clinicians were consulted, and 80 patients and their families. 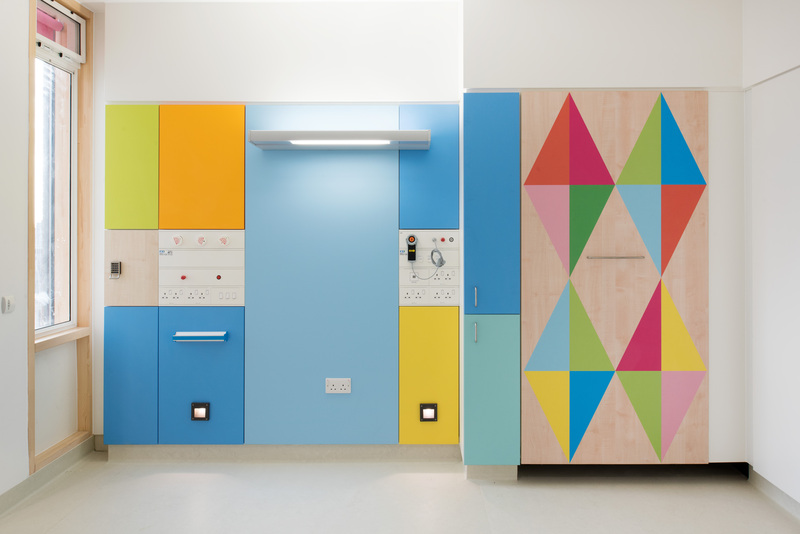 Clinicians were presented with ideas first, and Myerscough says that some of them were initially wary about using bright colours in wards and rooms. 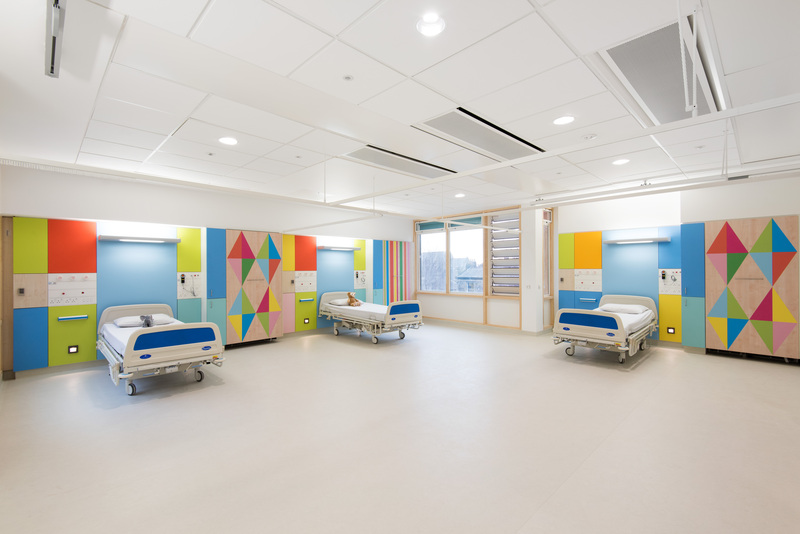 Artfelt manager Cat Powell adds that decorating wards and injecting colour into them does not only enhance the experience of patients, but also “helps the hospital save costs overall”. 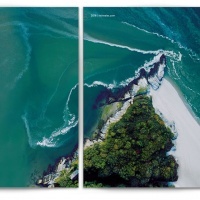 The designs were created by digitally scanning the wood grain pattern of laminate Formica material. 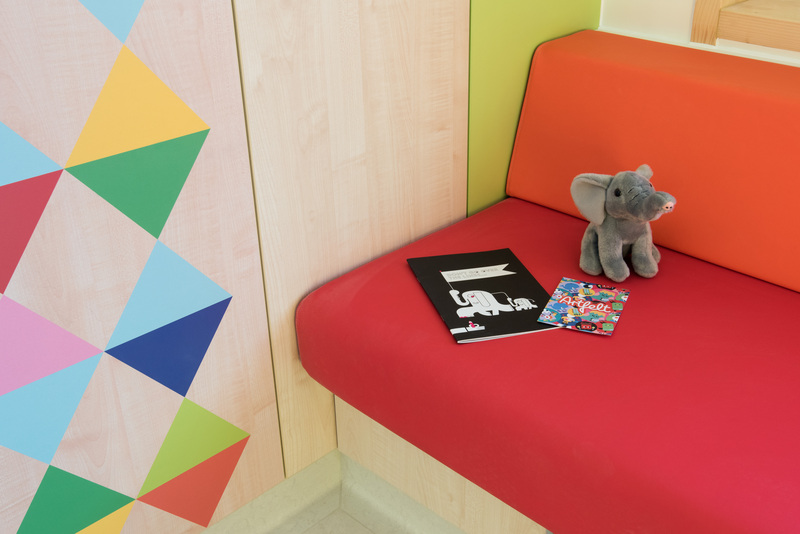 Patterns were printed onto paper and laminated rather than being painted directly onto walls to adhere to the hospital’s guidance on being sterile and easy to clean, says Myerscough. 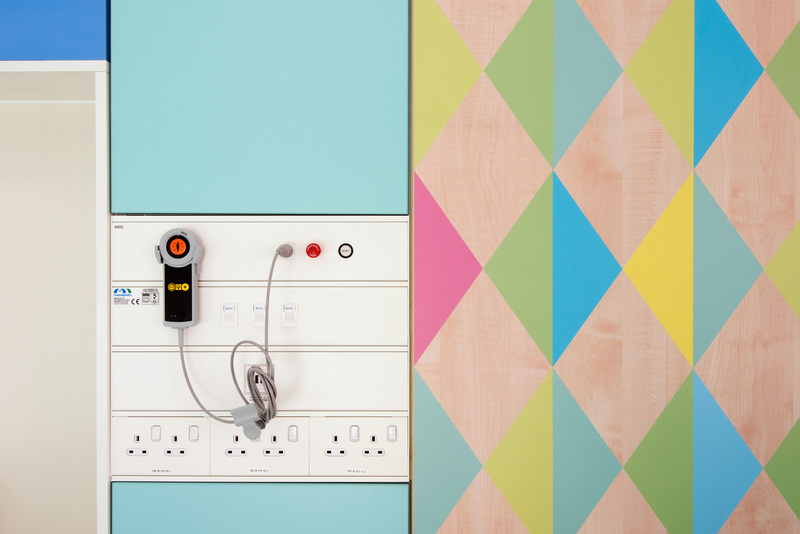 Plugs and wires were hidden by the Formica panels, and the colourful walls were paired with a neutral floor colour, she adds. The rooms were also built with large windows, to let in natural light. “Clinicians’ main objective is to improve people’s lives,” says Myerscough. 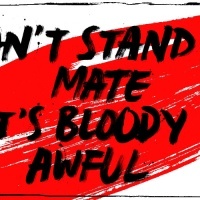 “They ultimately don’t want an artist to create something that will make patients upset. The main entrance and outpatients department of the new wing at Sheffield Children’s Hospital opened in November 2016. The bedrooms have now been completed and the whole site will be open for use from this summer onwards. All images © Jill Tate. These are really nice. The problem would be when other public service spaces are subjected to lower budget attempts in less capable hands. Like when people try to copy Matisse thinking that you just need bright colours cut out in funny shapes. Really good to see. One would have thought that clinicians would enthusiastically welcome these changes as they can only result in patients spirits being uplifted and their recoveries being speeded up. Google Images ‘Herlev Hospital Poul Gernes’ for an example of a similar scheme in Denmark.